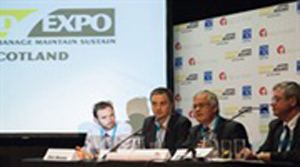 A high profile line-up of speakers has been confirmed for next month’s Road Expo in Edinburgh. Transport Scotland officials include head of construction Michelle Rennie, Hugh Gillies, who led the agency’s team for this year’s Commonwealth Games in Glasgow, and Donald Morrison who heads the asset management operation. They’ll be joined at the two-day traffic management and road maintenance event by Scottish Road Works Commissioner Elspeth King as well as representatives from the Road Haulage Association, the Society of Chief Officers of Transportation in Scotland (SCOTS) and Scottish Water. The central theme of this year’s conference programme will be the ‘Six Cs’ of confidence, cost, communication, competence, compliance and collaboration. More than 1,000 visitors are expected and around 100 specialist suppliers have taken space at the exhibition that will run alongside the conference.